Three years ago, we on the Gulf Coast lived out the consequences of having an inept president, cretin presidential appointees, and a craven Congress. We have continued to tell you about how dangerous things are when people like that are in charge. Now that the financial system is in a mess and there is no leadership on the job, do you believe us? San Francisco authorities have been notified but have been unable to capture or contain him. Via Adrastos, I found this helpful article from the Los Angeles Times. It ain't pretty for the family involved when stuff like that happens. Nobody in the GOP wants to talk about that, and the Catholic bishops who do everything but endorse McCain certainly don't want to talk about it. Compare Palin at mark 7:01 in this interview to the second video posted below. I find eery similarities in their respective voice inflections and in the way unrelated phrases and ideas are compressed together in potted meat food product manner. Rep. John LaBruzzo, who represents the lovely district in Metairie that gave us David Duke and national embarrassment, wants the government to pay people to sterilize themselves. Gee, I wonder if Archbishop Hughes and the "good" Christians of Rep. LaBruzzo's district will show the same kind of outrage they do when Democrats and other Republicans say the government should leave people alone over the issue of abortion? Okay, look: Dr. Mrs. Clio and I have four kids, so you can insert any kind of joke here that you want, and I would deserve it and laugh. And I'm not going to wag my finger at somebody for getting tubes tied or whatever it is that people do. However, for me, that decision just seems so permanent. Also, I work very hard to keep sharp objects AWAY from that part of my body. In the end, I really don't think sterilization is a good idea for anybody. Perhaps a thought experiment is in order. What if nuclear armageddon comes, and the only two people left are you and [fill in the blank: Halle Berry, Brad Pitt, Gina Gershon, Matt Damon, et al], and it's your job to repopulate the planet? You don't want to have to tell those people that you can't help them out, do you? Okay, I'm just drifting now. To sum up: I don't think it's a good idea for people to cut up their genital areas, and I certainly don't want to be forced to help them pay for it. THANKS METAIRIE! S.O.S. -- Deuce, You Listening? Coach Ain't. Until the Saints defense wakes up and Coach starts playing Deuce, I'm gonna spend a lot more time paying attention to World Class Angels Baseball. Tomorrow's video selection: "I Love L.A."
Today? S.O.S. Listen carefully to the words. Poignant. Coach. Deuce. Figure it out, gentleman. Deuce badly hurt his ankle. The whole week prior to a nationally televised night game versus the future Super Bowl champion Tampa Bay Decadence Denizens, Deuce was hobbling. And then on game day, they taped him up, and he did this. I've got to believe that the Deuce of 2008 is faster and more agile than the hobbled and taped Deuce of late 2002. Just Who Are the Terrorists, Anyway? If you want to read a legitimate political economist, go read Oyster. In particular, read his point about Dubya's sudden conversion from a president whose "philosophy" precluded Richard Baker's creative solution to post-Katrina real estate woes in south Louisiana to the guy ready to throw untold billions, in effect, at people who bet wrong on real estate in places like Florida, Arizona, and California. In his most recent post, Oyster has some fun with Dubya's interest in Doctor Evil. The President already has leveraged a terrible attack on our country on September 11, 2001, into a "Don't worry, go shopping" War that has cost thousands of American families their loved ones. A President once said,"The only thing we have to fear is fear itself"
That's what it used to mean. In the end, it's much easier to get a figurative Wall Street bailout than it is to get a literal South Louisiana bailout. Disgusting. Let's all welcome Joey Harrington to Our New Orleans Saints. In all fairness, he probably is now the best 3rd string QB in the league. Sage advice from Yoda over at Our New Orleans Saints. Learned about this from Suspect Device. This makes me laugh almost as much as a certain discourse on shaving. If you have any trouble getting up for today's game, just remember that FEMA is HQ'd just up the street from where the Saints are playing. That's what the parking lot was at Winn-Dixie today. Even though Ike is like 400 miles away, it made the weather a bit armaggedonish even in New Orleans today. It wasn't the clouds and rain. It was that freaky hot wind. Yuk. I'm glad Houston finally woke up and got its act together about Ike. To judge by the cover of the Houston Chronicle a few days ago, Ike was somebody else's problem. I'm worried about Galveston and the peeps I know there. If you go to the College Inn, you will see on the wall a quote from Dr. John through which he describes our Katrina experience (I believe): "I am traumaticalized." Who has looked pretty damn good over the past 10 days? Even Mayor Curly has had some really good moments--although I agree with Adrastos and others that the "mother of all storms" speech was irresponsible. If the above examples aren't reversification, I don't know what is. Berto and I have been practicing and noticing reversification in a variety of ways, and it works. Just one example: the jumpsuits are now shorties. The result? A big Saints win. Also, improbably, the ladies seem to like the shorties. Reversification, I believe, results in de-traumaticalization. Hey, New Orleans, change things up--but just a little. New Orleans Saints 24, Bucs 20. What else can I say? I have a post brewing that encapsulates some of what I've been stewing about through the whole Gustav experience. But tonight, the eve of the first Saints' season without Ashley and Brian, somehow it seems right to link to Brian's last-ever words on his blog. Oh, well, there are many other ways to be a fan as well. I am sure I will discover them. Happier posts later. I have internet, cable, and power at my house. I take none of this for granted. If I can help anyone with my undeserved bounty of modernity, please let me know. Jumpsuits were delivered by UPS yesterday! I couldn't believe it. Berto is hard at work with a Sharpie. I am working on adding a flag to my bike to copy the style seen in the beeee-YOU-tiful commercial below. More soon. In a hurry paying bills and cranking up my job again. Saints Game ON. Whither the New Jumpsuits? The Saints will play the Buccaneers in the Superdome this Sunday. Beautiful. Let us all keep perspective as we enjoy this truly communal event. In other news, the new golden jumsuits I ordered last week shipped on schedule. UPS says they will be delivered on schedule today. Um, I doubt that. But I hope by Friday. As you can see below, the suits are in Jackson, MS, right now. Maybe my friends Kay and Danny or some of the other Orleanians exiled there can pick them up for me on the way in. I predict UPS will come through on Friday and that Berto will be hard at work with a Sharpie on Saturday. See this link for a picture of Berto's suit (it's a shorty now) safely in a closet in a hotel near Montgomery, AL. This is NOT a complaint. I know hurricanes present a myriad of difficulties. I'm just posting to observe that there still seem to be problems with cell phones during disasters. I don't know if it's infrastructure or the shear number of simultaneous users. After Katrina, a tech guy with a cell phone company told me that the cell phone companies had "gone to school" on Katrina and that next time around, there would be better coverage and it wouldn't be so hard to get through. He said they were changing the way call were routed and such. It may in fact be better this go 'round, but it is still difficult. Text messaging seems to work pretty well, though. Again, this is not a complaint. I just wanted to post what I'm experiencing during the middle of this. 1. Fox News reported their Gustav coverage from their "EXTREME Weather Center." Huh? What is this? World Wrestling Federation? NASCAR? 2. CNN told Dr. Mrs. Clio that a levee had "breached." Oyster heard the same thing. Huh? 3. CNN made it clear that Shell Beach is part of New Orleans. 4. General Honore corrected the CNN weather idiot when the latter talked about "creeks and streams" filling up with storm surge. The General noted that in fact they are bayous and rivers. 5. Wolf Blitzer told me that Lafayette is 70 miles from New Orleans. That's more than 50 percent off. 6. At approximately 3:10 p.m. CST on September 1, 2008, some idiot on CNN with a cool Google map toy actually said that with Katrina, the big concern for Baton Rouge was "storm surge coming from the north along the Mississippi River." This time, however, the concern would be storm surge from Gustav coming UP the river from the south. Please read those last two sentences again. I won't even address the first sentence, such is its idiocy. The second sentence reveals total ignorance: if storm surge from Katrina up the river didn't affect New Orleans, Laplace, and all the river towns, why would it be an issue for Baton Rouge? 7. Dr. Mrs. Clio has been amused by many references to "East Jefferson County" emergency officials. I am watching the WWL-TV live feed on the web. Angela Hill looks fresh and civilized, as if it were a Saints win Monday. 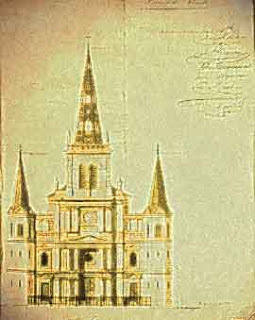 Carl Arredondo is showing live video of St. Louis Cathedral in the wind and rain. He reminds us that the Cathedral has seen many, many tropical storms and hurricanes. I'm thinking about St. Bernard and the Bestbank and Houma. I'm ready to get things straight there.